I am SinCity’s PREMIERE Best Tim McGraw Lookalike Impersonator Tribute. I look AND sing just like the real deal. 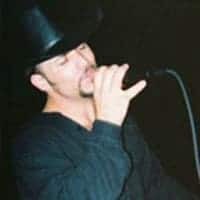 I have been impersonating Mr.McGraw for years now, have performed 70 of his songs, placing in numerous contests, and have even performed on local television series ‘Singsations!’. I promise you won’t be disappointed!!! Invite Tim McGraw Look Alike Impersonator Tribute to your next event. All live vocals and great Tim McGraw Lookalike Impersonator Tribute costumes. He never disappoints and is always a big hit at every event he is invited to. You will not be disappointed having Tim McGraw Look Alike Impersonator Tribute at your next event. All live vocals and a real cowboy hat to boot. Can have Tim McGraw Lookalike do a full stage show with a full band and dancers or a track solo show. Both shows are a wonderful experience and will create a lasting and beautiful memory for you and all of your guests. Invite Tim McGraw Look Alike Impersonator to your next VIP Special Event or Party. He is always a huge hit at every event he is invited to. Great for photos, a full concert or to even sing a few songs. Call Besser Entertainment today at 954-484-7884 or e-mail us at Party@BesserEntertainment.com.